Sometimes your eclipse viewing goes bad in an interesting way. While watching and photographing last Thursday's partial solar eclipse, a popular astronomy blogger suffered through long periods of clouds blocking the Sun. 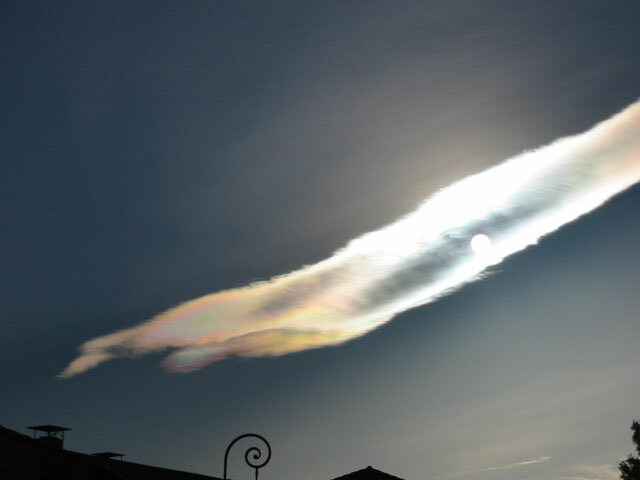 Unexpectedly, however, a nearby cloud began to show a rare effect: iridescence. Frequently part of a more familiar solar corona effect, iridescence is the diffraction of sunlight around a thin screen of nearly uniformly-sized water droplets. Different colors of the sunlight become deflected by slightly different angles and so come to the observer from slightly different directions. This display, featured here, was quite bright and exhibited an unusually broad range of colors. On the right, the contrails of an airplane are also visible. Why would a cloud appear to be different colors? A relatively rare phenomenon known as iridescent clouds can show unusual colors vividly or a whole spectrum of colors simultaneously. These clouds are formed of small water droplets of nearly uniform size. When the Sun is in the right position and mostly hidden by thick clouds, these thinner clouds significantly diffract sunlight in a nearly coherent manner, with different colors being deflected by different amounts. Therefore, different colors will come to the observer from slightly different directions. Many clouds start with uniform regions that could show iridescence but quickly become too thick, too mixed, or too far from the Sun to exhibit striking colors. 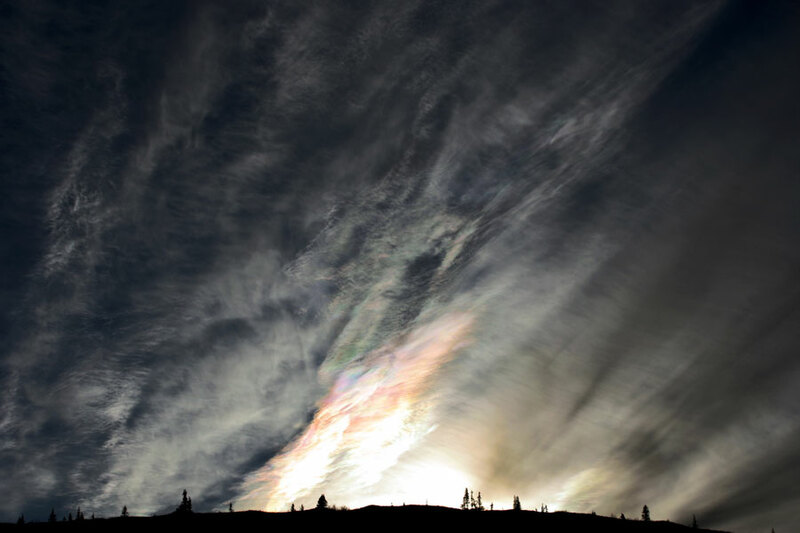 This iridescent cloud was photographed last year from the Top of the World Highway outside Dawson City, in the Yukon Territory in Northern Canada. Why would a cloud appear to be different colors? A relatively rare phenomenon known as iridescent clouds can show unusual colors vividly or a whole spectrum of colors simultaneously. These clouds are formed of small water droplets of nearly uniform size. When the Sun is in the right position and mostly hidden by thick clouds, these thinner clouds significantly diffract sunlight in a nearly coherent manner, with different colors being deflected by different amounts. Therefore, different colors will come to the observer from slightly different directions. Many clouds start with uniform regions that could show iridescence but quickly become too thick, too mixed, or too far from the Sun to exhibit striking colors. 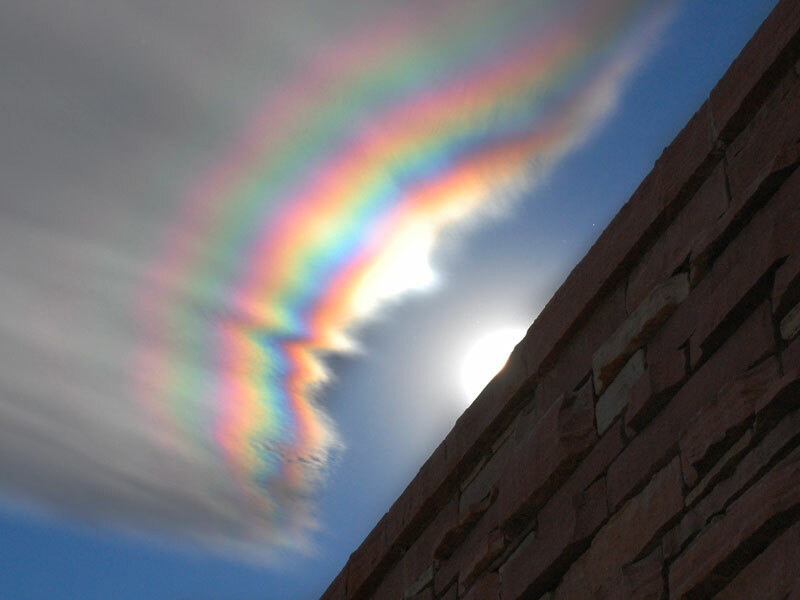 This iridescent cloud was photographed above Boulder, Colorado last week. What kind of cloud is that? Last week, a sunset rocket launch lit up the sky and was photographed by sky enthusiasts as far as hundreds of miles away. The lingering result was a photogenic rocket plume. Not everyone who saw the resulting plume knew its cause to be a Minotaur rocket launched from Vandenberg Air Force Base in California, USA. The cloud was visible after sunset on 22 September. Fuel particles and water droplets expelled from the rocket swirled in the winds of the upper atmosphere, creating an expanding helix. 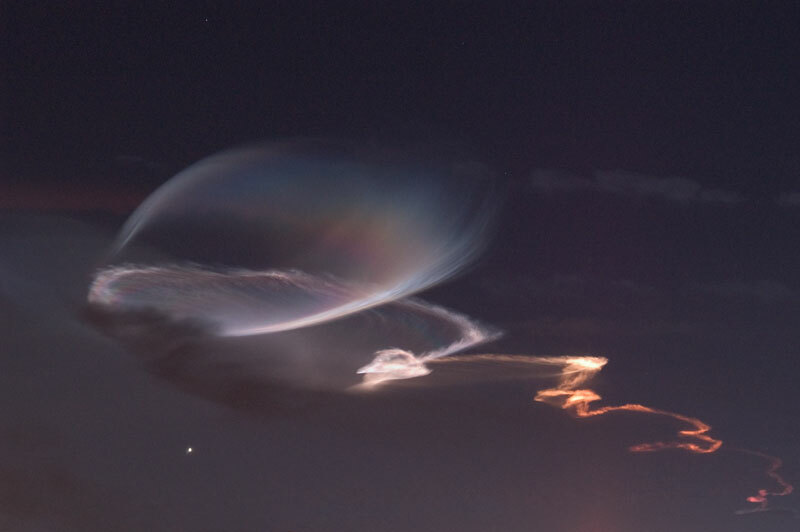 The noctilucent plume was so high that it still reflected sunlight, where lower clouds in the foreground appeared dark. 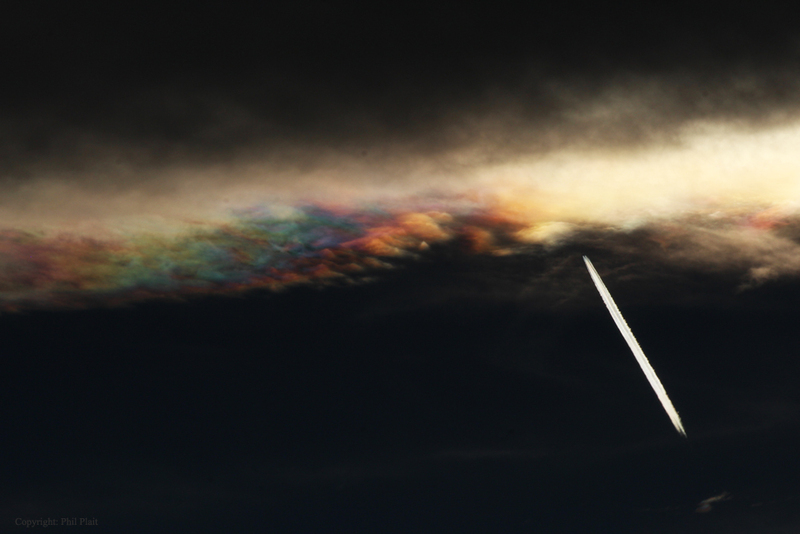 The above image also captured part of the plume reflecting sunlight as a rainbow or a colorful iridescent cloud. Below the launch plume is the planet Venus. Before the sun rose over the mountains, iridescent colors danced across the sky. The unexpected light show was caused by a batch of iridescent clouds, and captured on film in early September in Arolla, Wallis, Switzerland. The peak in the foreground of the above image is Aiguille de la Tsa. Iridescent clouds contain patches of water droplets of nearly identical size that can therefore diffract sunlight in a nearly uniform manner. Different colors will be deflected by different amounts and so come to the observer from slightly different directions. Iridescent clouds are best seen outside the glare of the direct Sun although they can occasionally be seen to encircle the Sun. Why would clouds appear to be different colors? A relatively rare phenomenon known as iridescent clouds can show unusual colors vividly or a whole spectrum of colors simultaneously. These clouds are formed of small water droplets of nearly uniform size. When the Sun is in the right position and mostly hidden by thick clouds, these thinner clouds significantly diffract sunlight in a nearly coherent manner, with different colors being deflected by different amounts. Therefore, different colors will come to the observer from slightly different directions. 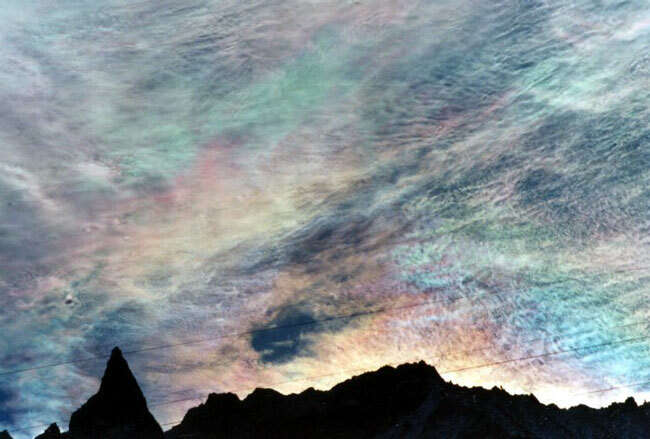 Many clouds start with uniform regions that could show iridescence but quickly become too thick, too mixed, or too far from the Sun to exhibit striking colors. 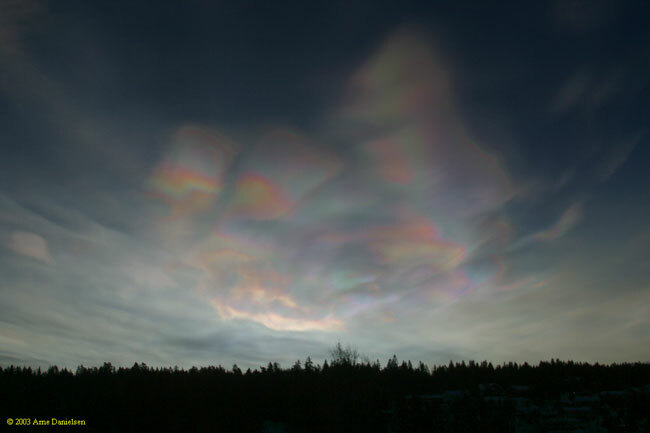 Pictured above, iridescent clouds were photographed over Norway two months ago. Are you an early riser? Over the last month or so, the bright planets Jupiter and Saturn have come to adorn eastern skies before sunrise. In fact, astrophotographer Joe Orman anticipated that an early bird's reward for looking east on June 10 would be this pleasing arrangement of Jupiter (top right), a crescent Moon, and Saturn (near center), but he was surprised to also find these eerie, iridescent clouds wafting through the pre-dawn sky over suburban Phoenix, Arizona, USA. The clouds turned out to be rocket engine trails from defense missile tests at the range in White Sands, New Mexico ... about 300 miles away. While the Moon's phase is just past new moon, gone now from the pre-dawn horizon, brilliant Jupiter and Saturn can still be seen high toward the southeast in the constellation Aries. 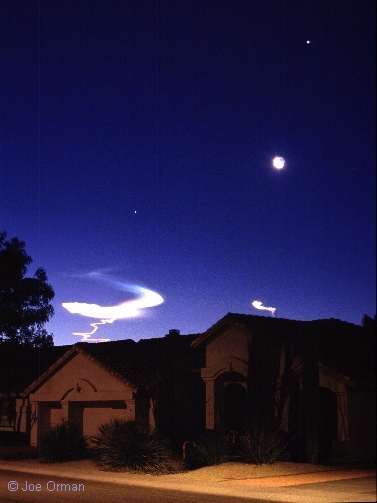 Regarding the July 1999 photo of the rocket trail: I live in the suburbs of Phoenix, Arizona, and remember seeing this -- and being stunned by it! I was so glad to find out what it was, even after the fact. How wonderful to find a picture of it!